This section of our site is devoted to shop models. We add approximately 4 to 6 new models every other month to our ever growing collection. These are the current New Shop Models that we have added in our shop. We do not always stitch designs which are new, just whatever strikes our fancy. Because a pattern is old doesn't make it any less attractive. If the pattern is still available, after stitching, we then feature it as a New Shop Model on our walls. We have had a few customers who were generous with letting us display there finished work in our shop. Some of these designs will be show cased as well. If you like the way our shop models look, we now have added a feature that you can purchase the pattern or we will offer as a kit including pattern, fabric, and floss just like our model. Additional options exist that will allow you to purchase just the pattern, just the floss, or just the fabric. You are ONLY purchasing the materials to make the design, not our finished model. Hope you like our selections. A total of 278 records matched your search. When this pattern arrived from Imaginating, I just knew I would stitch it as a model. 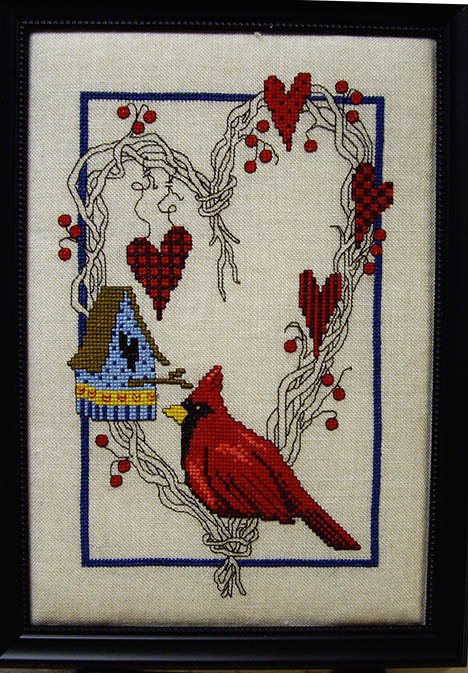 I loved the cardinal, and the red hearts just added to the mix. 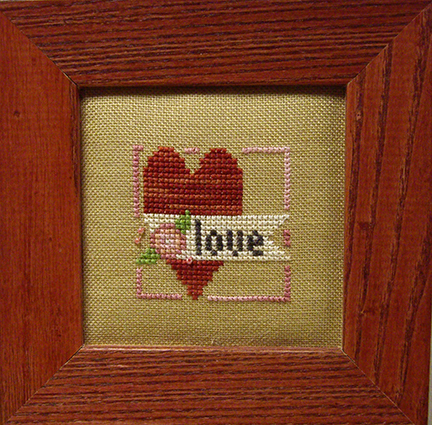 Nothing hard, uses DMC floss and is coded for Aida - I did use 28 Ct. Flax Linen - the frame is a custom red. Sometimes I like to do something for fun and this design from Bent Creek was a car project for the last year. When I was hunting for something to stitch at the beginning of February, I figured now was the time to finish. The design was stitched on 18 Ct. Linen over 2 which makes it finished as an 8 Ct. and I used #5 Pearl Cotton - nothing hard, just a fun. 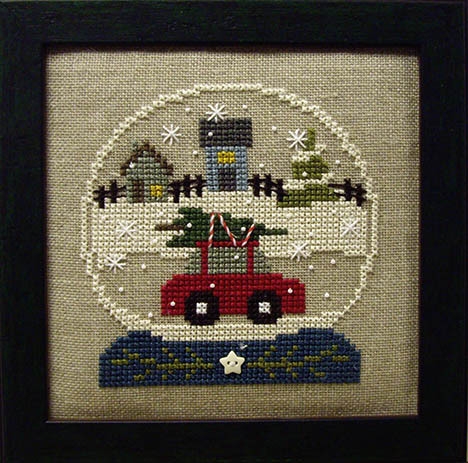 I have stitched other Uber design which have been a hit in our shop. 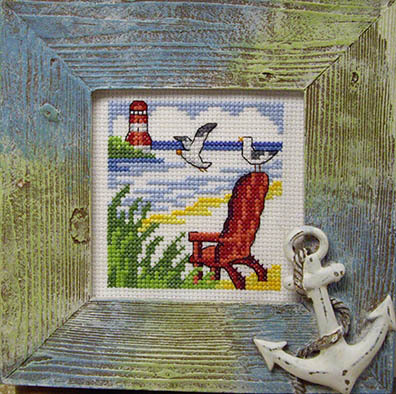 Sometimes it is fun to stitch something larger - give it a try, you might like the look. 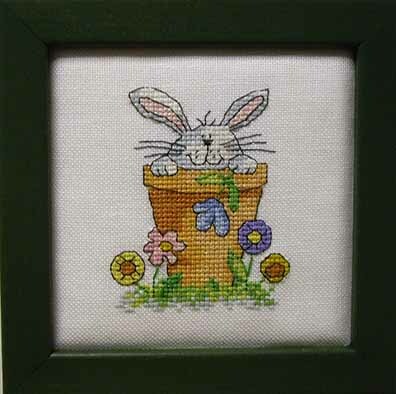 Every so often I take a look at the kits we sell, and pick one to stitch. I finished this one in January. It is from Design Works - nothing hard, done on 14 Ct. Aida. When finished it fit a standard 8" x 10" frame and I have the one shown in my stash. Isn't it cute! 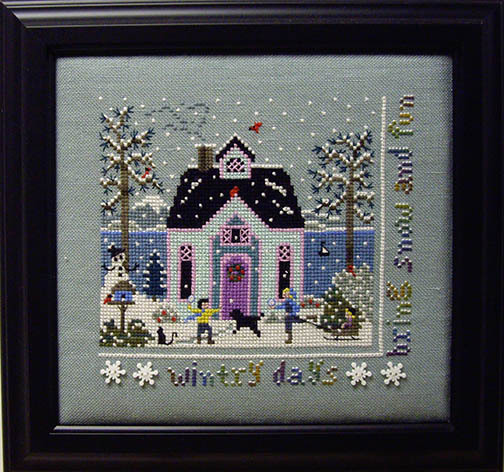 Since I have been stitching Button & Bead Kits by Mill Hill last year, when this new release arrived, everyone in the shop knew I would stitch it. 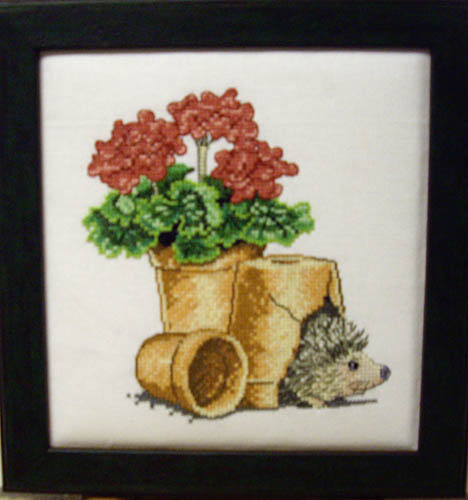 I used what was included in the kit and framed in the recommended White Mill Hill premade frame. It has been a big hit in our shop. Now that Diane has retired, it has given her time to design some new released. This is the first of two that will be posted this month. 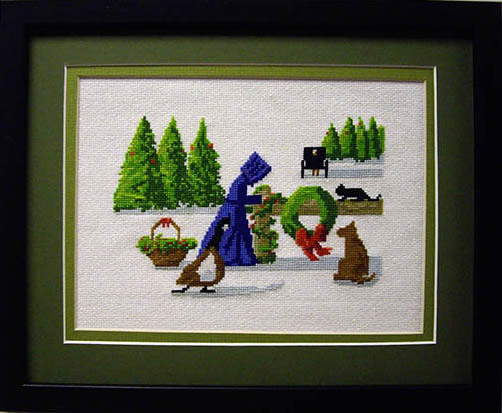 I stitched my model on 18 Ct. Opalescent Aida to give it the appearance of snow and custom framed using two green mats, and a black frame. During the holidays I looked for somthing that would fit over a doorway, and came across the pattern from Diane Arthurs and Imaginating. Nothing hard, stitched with DMC floss, and I used 28 Ct. White Jobelan. The frame is a brushed edge custom green. I just loved the results, hope you all like it as well. When I pick models to stitch, I like to do something hard, then something easy. I found this cute offering from Madam Chantilly that I loved. 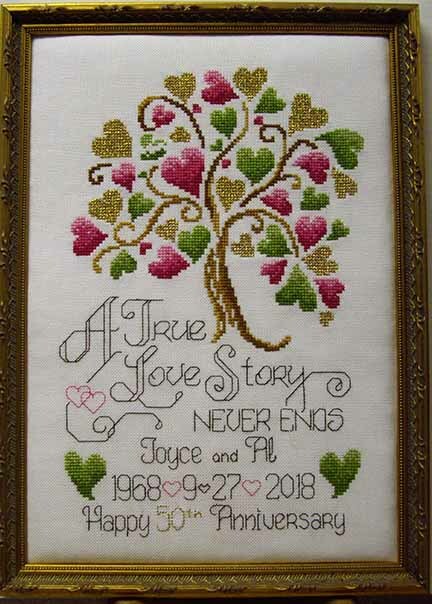 However, I usually don't tweek a design, but there was too much white for my liking, yet I loved the design - so I added a little Kreinik and changed some of the ball colors, and added gold stars to the trees. Also I stitched on 32 Ct. Opa/Raw Belfast Linen, and framed in a brushed edge green frame. Hope you all like the finished piece as much as I do. For the last few years I have stitched a a sampler from The Victoria Sampler - so I decided to break up the trend and look for something different. 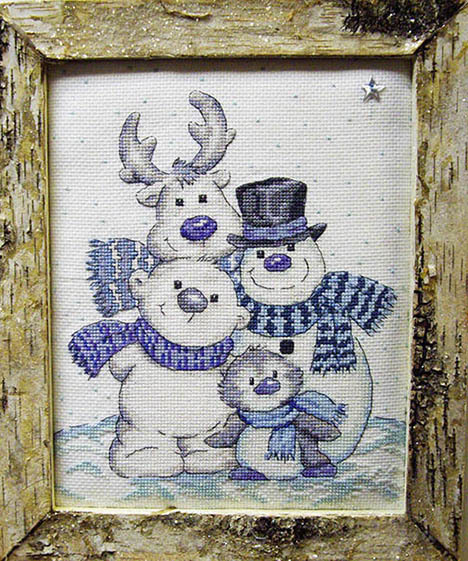 I would this offering from The Drawn Thread and loved the verse as well as the snow coverd house scene at the top and the animals with a snowman in the center. I did use the recommended silk floss, and framed in a cherry frame. If you stitch designs from The Drawn Thread and feel the silk to expensive, you might not know that she uses the same color palette, and the silk seems to go a long way. Sometimes it is worth the price - also they give hand-dyed floss alternates for all silks on their web site. 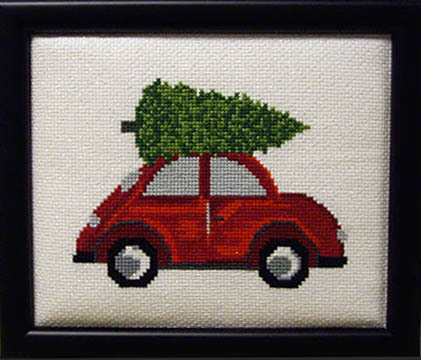 Every year I put this pattern aside and stitch something else. So I decided this was the year to finally add to our models. This design is from Bent Creek and is an oldie but goodie. Again, nothing hard, uses hand-dyed floss, but I believe they give DMC alternates, and I stitched on 32 Ct. Opal/Raw Belfast Linen. I again used a brushed edge green frame. I just loved the end result, and should have stitched sooner. Sometimes when I decide what to stitch for shop models, I try to pick something different. I throught that we needed new bird models and found this one by Heritage Crafts was just the thing. 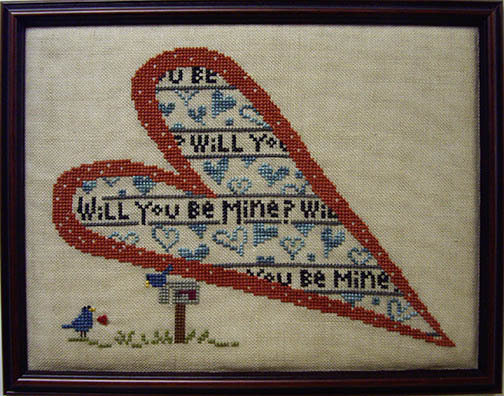 I stitched the model on 28 Ct. White Jobelan using DMC floss, and the frame is a premade by Mill Hill. Isn't it cute! This kit has been in my stash for at least a year, and since I have been stitching many Button & Bead Kits this year, I felt now was the time to do it. Nothing was hard, and I found a pre-made Mill Hill frame with trees accenting that fit the bill. 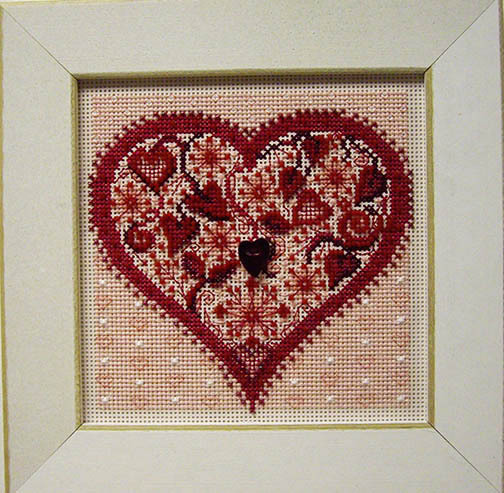 I might stitch another Button & Bead kit before Christmas - if I do, you'll see it soon. Since I like the Welcome series by The Drawn Thread, I just had to stitch their Welcome Autumn. I loved the colors on the 30 Ct. Antique Lambswool Linen and did use the recommended silk floss, however I used 2 ply of all floss colors for cross stitches, rather than the one ply that the designer recommended. The frame is a brown with gold edges and matches the brown that was used in the design. Again nothing hard and took no time to stitch. Since I was playing around with a new inventory package, it has been hard for me to stitch on a regular basis - since that episode of my life is over, I am now back to stitching up a storm. 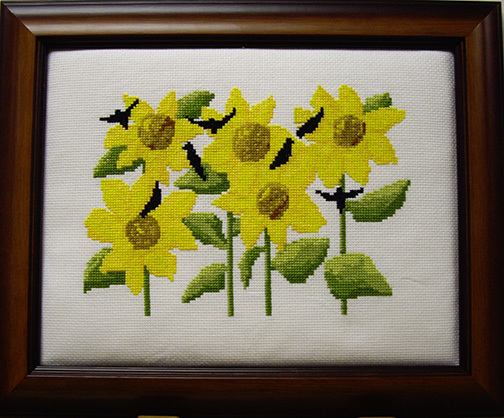 This is the NEWEST release from Diane Graebner with lovely sunflowers and crows for Autumn. 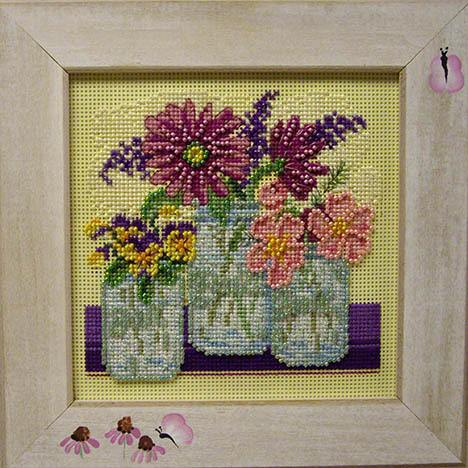 I stitched this on 16 Ct. White Aida, rather than the recommended 18 Ct. to make it a little bigger using DMC floss - a custom brown frame was used to bring out the center of the flowers. 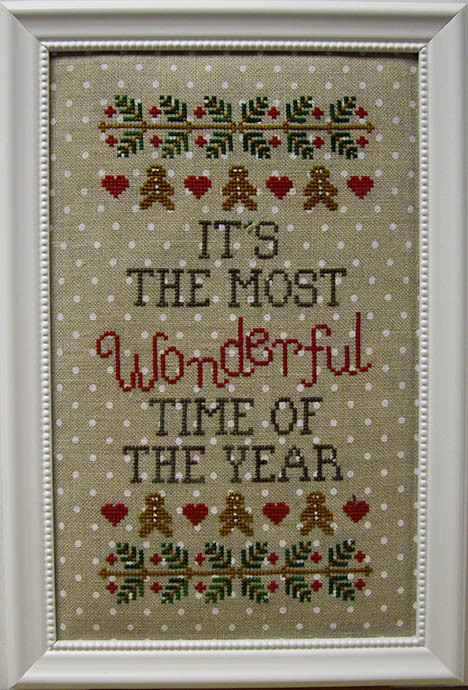 In case anyone is wondering, I have been stitching - and this time of year I like to stitch designs relating to the season. 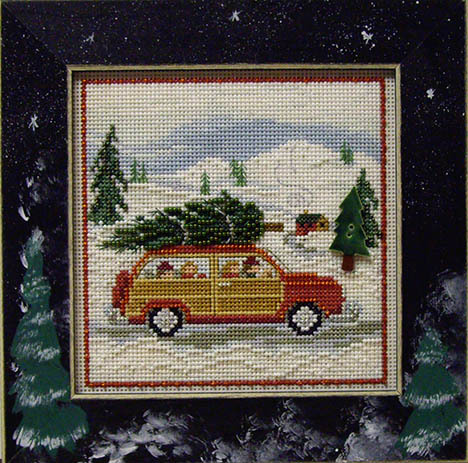 When this Button & Bead Kit arrived last year, I just loved the scene - so when I decided to look for patterns for new shop models, this came to mind. Everything is included in the kit - and as always, I had a Tacky Bob for my beads. 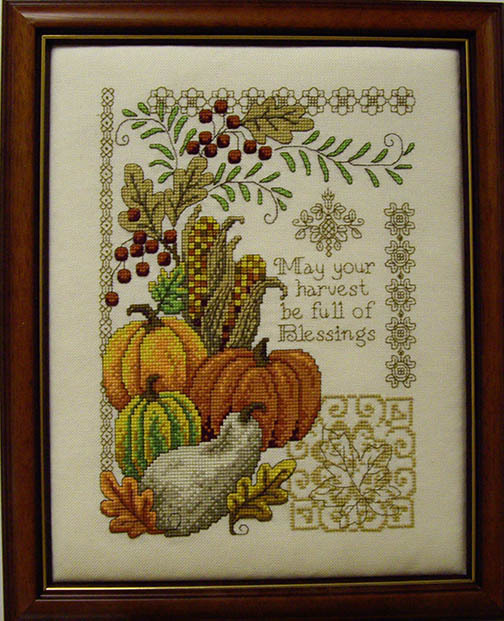 Nothing hard - I had plenty of beads and floss, stitched on perforated paper, and framed in a Mill Hill pre-made frame that had painted pumpkins on the frame. Didn't turn out great! Since I have been stitching Welcomes from The Drawn Thread, it was only right that I add their Halloween Welcome to our shop models. Nothing hard, I did use TWO THREAD, rather than the one stand recommended by the designer. I was a little disappointed with the Welcome Spring being light, so I decided that I was going to use two stands of floss when stitching these designs from now on. I loved how the colors showed up and I used a black wavy custom frame. I know the Drawn Thread uses silk floss for her designs, however she uses the same colors - so the expense is about the same as using other hand-dyed flosses. And the silk seems to go further. Hope you like this model - I am working on the Welcome - Autumn will be posting in the future. Since Diane Graebner retired, she has not stopped designing. This is one of her latest offerings - I finished this a few weeks ago, and it is now ready, and under our What's New section. Isn't it cute. Besides the dog chasing the cat, there is a cat following behind chasing the dog. 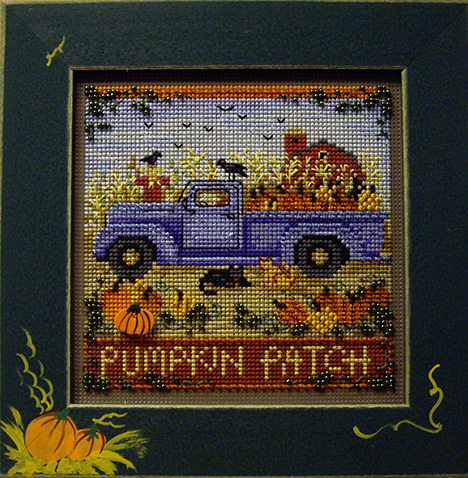 Nothing hard, and really a nice Autumn offering, I did stitch on the recommended 18 Ct. Aida using DMC floss. 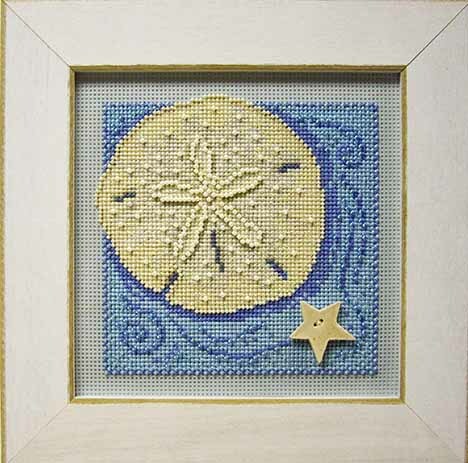 This is another seashell that I chose to stitch - it is a Mill Hill Button & Bead kit. Nothing hard, and really turned out great. I used a pre-made white Mill Hill frame. 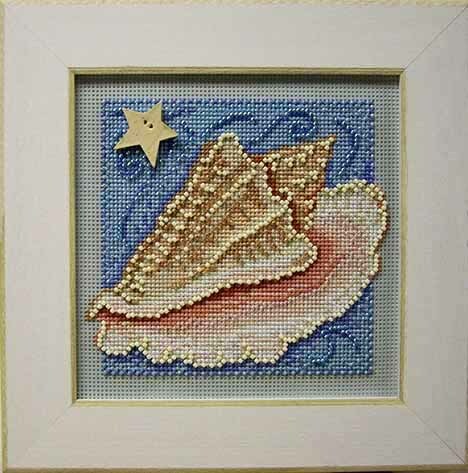 These seashell kits from Mill Hill are very realistic - once on the wall, most people do not realise they are beaded. 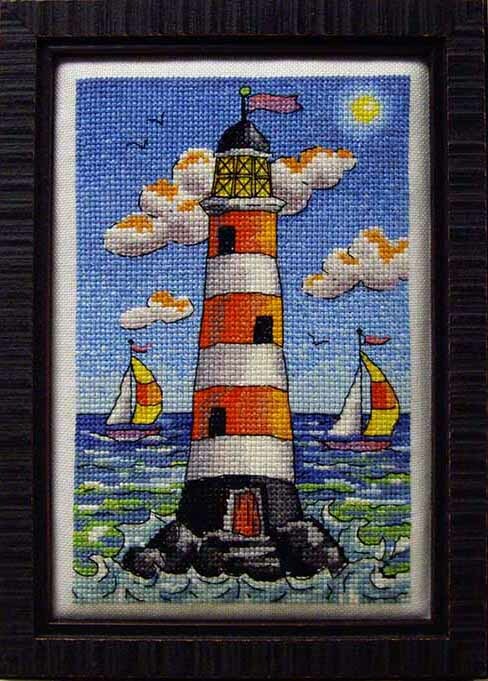 I usually like to stitch beach or nautical designs in the summer and found his kit from Permin. It was fun to stitch, nothing hard, and comes with everyrhing. I had this frame from last year when I picked it up shopping, and it made a good fit. Ever since we pickup Madam Chantilly, I just love her style - so when I was searching for something Springy - this one was a good fit. 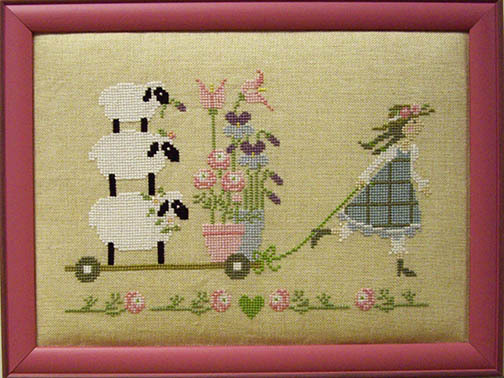 I loved the combination of the little sheep, and flowers for spring. Again, nothing hard, and I used the recommended floss. The frame I used is pink with brush edges. Isn't it cute! 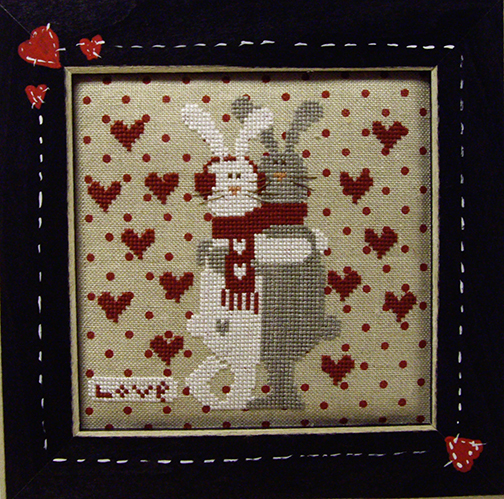 From Madam Chantilly comes this fun pattern that when we received in our shop, I knew I was going to stitch as a model. Nothing hard, done in DMC floss, and I did use 32 Ct. Natural Belfast Linen. The frame is a custom green with a brushed edge. Isn't it cute! As I stated before, I love the Welcome series from The Drawn Thread. When I started this offering, I used the recommended 1 ply of thread on 30 Ct. Antique Lambswool Linen. I can honestly say, I would have preferred the colors to look a little darker which would have been obtained if I used two ply of floss. So - the rest of the designs in this series I will use TWO ply rather then the recommended ONE ply. The result is very nice, with a pastel look. 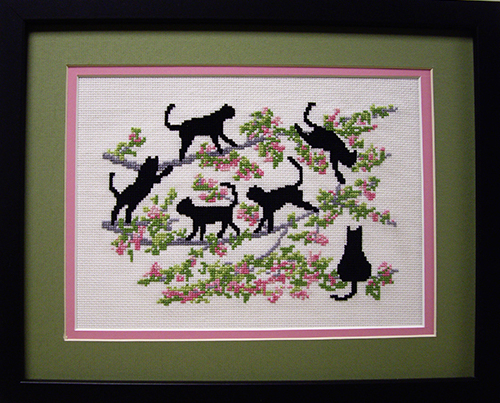 I did use the recommended silk which is used in other patterns in this series, and custom framed in my favorite green frame with a brushed edge. I will be stitching other in this series throughout the rest of this year. With Winter never seeming to end this year, I had this pattern aside for over a year and thought, I guess now is the tine to stitch as a model. 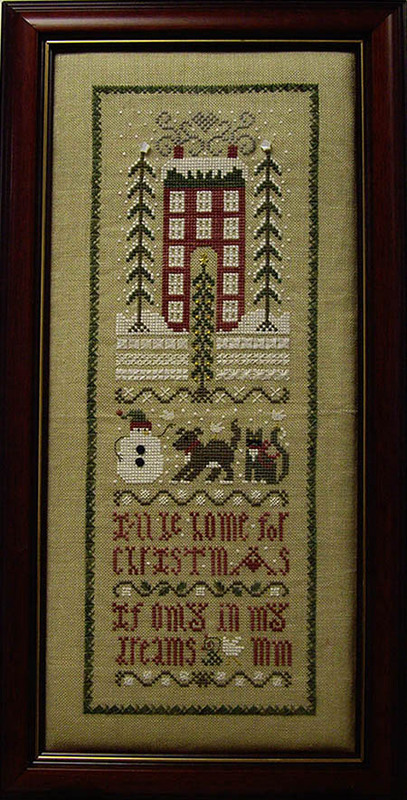 I did all the other seasonal houses from The Victoria Sampler, and enjoyed stitchig this one as well. The floss pack contains silk floss and all beads. Nothing hard and I love the finished product. A custom frame was used to bring out the colors. As I have stated many times before, Diana Graebner has retired, and we are now her exclusive distributor. Well she is still designing here and there. This is the latest pattern she sent to me, so I thought I would take the time to stitch as a new model. I used 18 Ct. Whtie Aida and DMC floss. 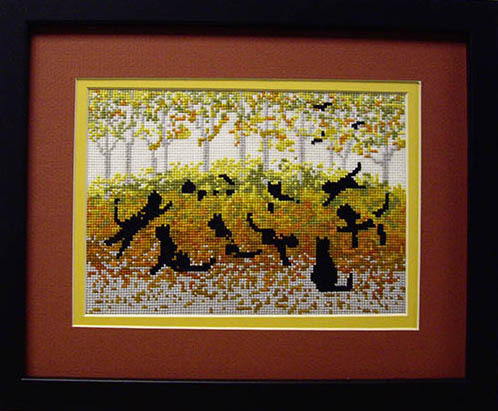 Nothing hard, and I did mat and custom frame to bring out the colors of the leaves. Isn't it fun! Hope you all love it as much as I do. 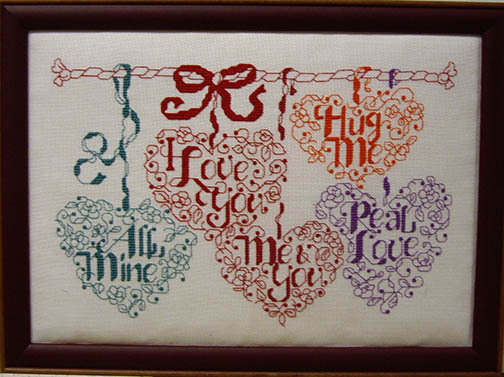 Since we are the distributor of Diane Graebner Designs, I stitch all of her new releases. This one was received in December and I love her little black cat designs. This one was easy, and worked up nicely. 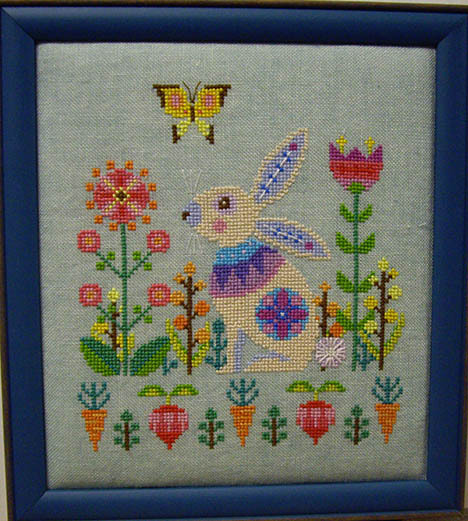 The colors represent Spring - I did custom frame using two mats and a black frame. Watch for more in the coming weeks. Since Diane retired, she keeps charting new items. I will be starting a new release within the next few weeks. Since our Philadelphia Eagles football team won the division and then entered the Super Bowl, I wanted to find something to stitch to honor this occasion. 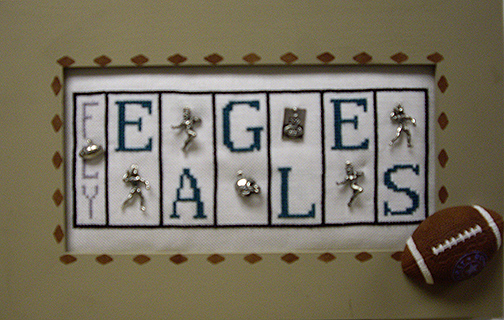 I had this pattern aside for some time, and just reconfigured the letters of Football to spell out the word "Eagles". I added the "Fly" as their fight song is "Fly Eagles Fly". The frame is an old one from Kay's Frames that I had her make years ago to fit the word Eagles. I used 28 Ct. White Jobelan, and used two colors of DMC floss to match the teams colors. I was stitching this as our Eagles won the Super Bowl. It has been a while since I posted shop models due to waiting for frames. 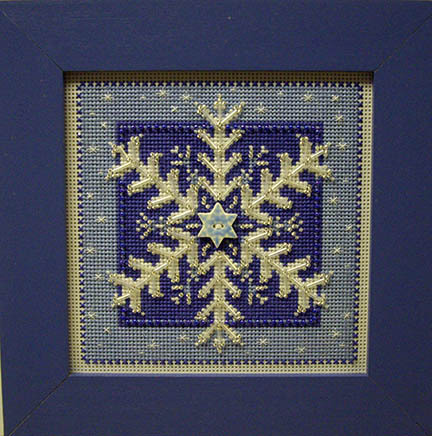 I stitched this model because we had the periwinkle blue frame in stock. It is a Mill Hill kit that includes everything but the frame. 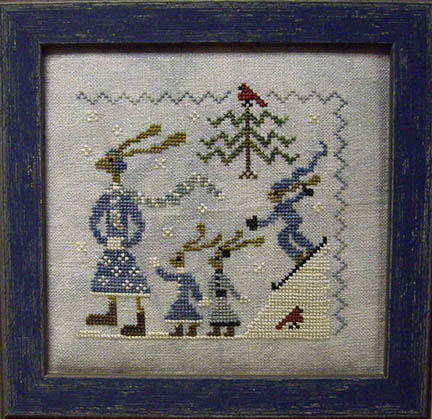 It was fun to stitch and a nice addition for our Winter display. 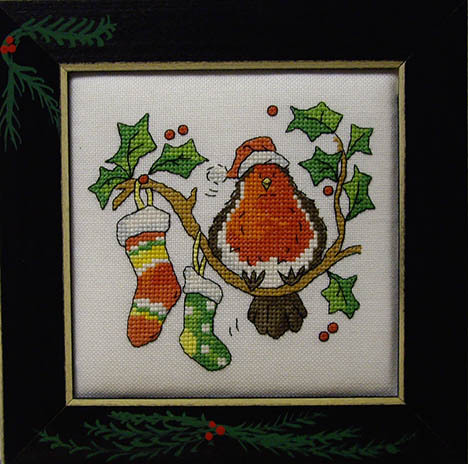 If you love Christmas, then this is a good pattern to stitch from Country Cottage Needlework. 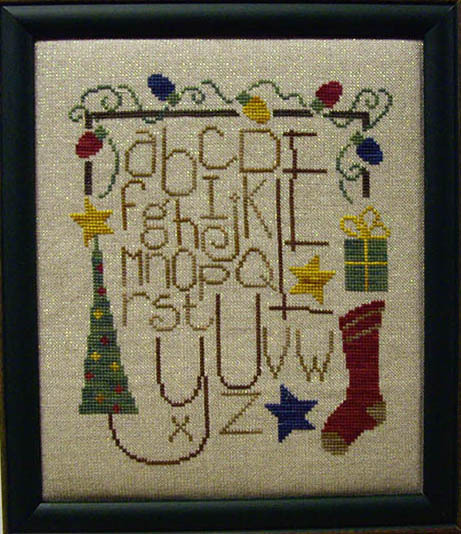 After Christmas I was looking for something to stitch that I could get done fast, and this one jumped out at me. Nothing hard, works up quickly, and I framed in a custom white frame. I love the background which is 32 Ct. Natural w/White Dots - hope you like it too. 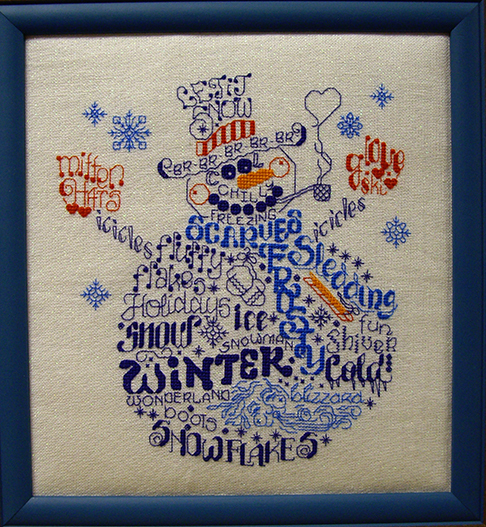 When this Welcome arrived in our shop from The Drawn Thread, I loved the stockings that are inside the letter "O". 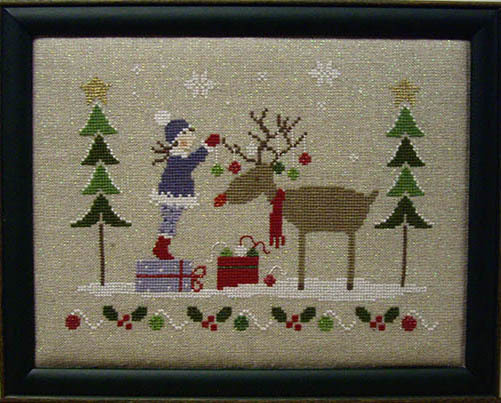 It is stitched over one thread, but you also are given a version that is over 2 threads or for the Aida stitcher. I did use the recommended silk floss, but changed the fabric to a raw linen with silver flecks that I had in my stash, and really like the end results. 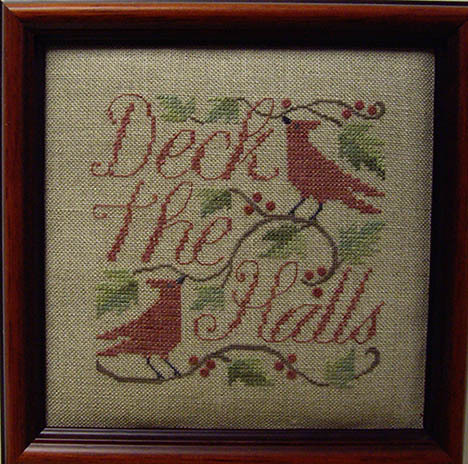 Little burgundy buttons are added to the holly that wraps around the star in the lettter "C". This frame that I chose is cherry color. 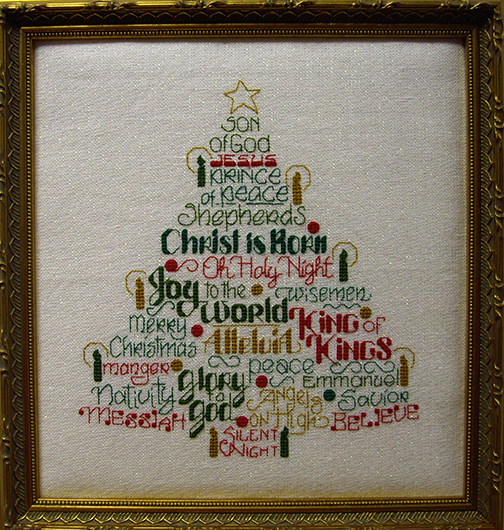 This is the first Christmas Welcome that I stitched, and since I like it so much, there may be more models in this series on the horizon. Since I stitched a shop model for Christmas from The Drawn Thread last year that had a verse, when this one arrived, I decided it would make another nice model. I did use the recommended one strand of silk, and stitched on 28 Ct. Natural with Silver specks. If I had to stitch over, I think I would have used two ply of floss to make it a little darker, but love the results anyway. Again, I used a custom cherry frame. The berries are stitched and you have a choice to stitch it over 1 thread or 2 for the branch - so it is a good design for anyone to stitch. 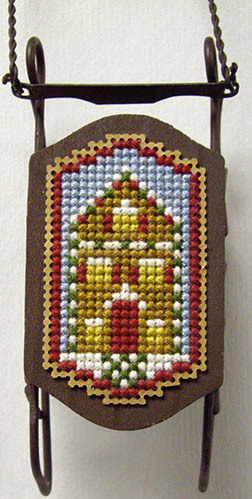 Since we had no models these wonderful fast to stitch sled ornaments, I looked through the patterns we had in stock, and chose this little gingerbread house from Foxwood Crossing to use for a shop model. Nothing hard, it was stitched on 14 Ct. Brown Perforated Paper using DMC floss. All I did when finished was cut around the design, and glue on the sled ornament. Nothing hard - and these sleds look like they take more time than they really do. A great ornament gift and you can get one done in a night or two. Hope you like the pattern I picked.